The origin of Baptist work in Rugby is obscure. Apparently two Cromwellian soldiers preached in Rugby in 1646 and baptized six women in the mill dam, but we do not know whether this resulted in a regular meeting. Soon after 1700, however, a Baptist cause existed with regular meetings, for it is mentioned in the will of Elizabeth Marriott dated 1732. Her brother, John Shenstone, was elder of Baptist churches in Welton, Braunston, Napton, Thurlaston and Rugby. The Baptist churches at Rugby and Braunston still benefit through the generous provision of this will. 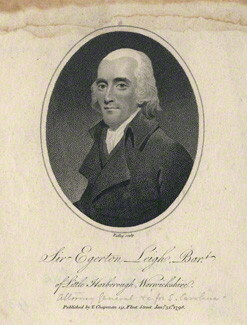 Again it is doubtful whether this cause had continuing life, for about 1800 Sir Egerton Leigh was having great difficulty in establishing Baptist witness in Rugby. Sir Egerton Leigh was born on 25th March 1762, in South Carolina, a descendant of the Leigh family which, from the days of the Norman Conquest, had lived at High Leigh, Cheshire. His grandfather, Peter Leigh, dissipated a large fortune and then commenced a new life in America. His father rose to eminence, becoming Chief Justice of South Carolina and being made a baronet in 1773 as a reward for "fidelity, loyalty and uprightness". The American War of Independence, bringing the loss of his position and wealth, "broke his heart" so that he died in 1781. The childhood years of Sir Egerton were happy, whether the time was spent with his parents or with his maternal grandmother who gave him an example of personal Christian faith. About 1770 lie was sent to England to Westminster School where he suffered a good deal of ill health. When he was 15 he entered the army and soon found himself travelling again to the American Colonies, where he shared both the hazards and the gaieties of army life. After his father's death he left the army, fell in love with a young married woman, then realizing his position sailed back to England landing at Dover in 1782. There followed a period of melancholy, relieved by the "dissipations of the town," and some affairs of the heart. He records a number of dreams during this time when "I was in great trouble and my mind very uneasy". One of these dreams brought a vision of Christ and the end of his troubles. The same year in Bath he met his future wife, an heiress to a considerable fortune, named Theodosia Boughton. Through these difficult years Sir Egerton had remembered the teachings of his parents and grandparents, and had been regular in attendance at the Established Church, but he was not satisfied. At the end of 1792 he attended Whitefields Chapel in Tottenham Court Road, where he felt the "reality that I had been in search of". This association with an evangelical group led to a personal faith and changes in the manner of his living. In his own words, "I had at this time left off liquor. I rise early and in perfect health and good spirits - more regular, cheerful and happy in my mind than I ever remember to have been." About this time he settled at Little Harborough, with a London house in Cavendish Square. It is now that Sir Egerton's period of active Christian service begins. He became well known as a preacher and often crowds gathered at his house to listen to him. The results were seen in conversions and in the establishment of some churches. In 1797 lie was ordained to "all itinerant ministry" at a service held in London and conducted by the popular preacher, Rowland Hill. His evangelistic work brought risks and difficulties. When a chapel was being erected at Wolston, opponents pulled down during the night what had been built during the day. Sometimes missiles were thrown at the preacher, and on one occasion at least an attempt upon his life was planned. The labours of Sir Egerton were not confined to Warwickshire. In 1795 the initial meeting of The Missionary Society (later The London Missionary Society) occurred and its chairman was Sir Egerton. When he later accepted Baptist views he supported the Baptist Missionary Society and the accounts for 1804 and 1805 record his generous donations. He was prominent also in the formation of a "union of serious Christians" in Bedford, which brought together evangelical Christians of several denominations and was responsible for some effective evangelism in the area. Some of its early meetings were held in Sir Egerton's house. The home life of Sir Egerton Leigh, first at Little Harborough and then at Brownsover Hall, appears to have been very happy. There were two children, a daughter named Theodosia and a son Egerton, who died at 13. Religion was a real factor in the home life, not only among the family but also among the servants, In a journal Sir Egerton tells how he met for Bible study and prayer with his men Edward Southam and William Davenport; these two men founded and were first members of the Baptist church at Draycote. About 1800 Sir Egerton made an attempt to begin work in Rugby. Previous attempts made by others had been frustrated by the ecclesiastical authorities in the town, but Sir Egerton held services in a cottage until a piece of land was purchased and a modest building erected, having on a stone the words : "Foundation laid by Lady Leigh 1803." The opening sermons were preached by Andrew Fuller of Kettering and John Sutcliffe of Olney. In 1805 the building was enlarged and a small graveyard came into use. The church continued on this site at the junction of Gas Street and Castle Street until the erection of the present premises. The church expanded on 27th March, 1808, when the church at Little Harborough was dissolved and its few members then joined the Rugby church.The names of Sir Egerton and Lady Leigh are the first two in the list of members. Sir Egerton acted as pastor of the church until 1811 and it is clear that he gave much thought and time to the work. He published a little book called "The Answer of God" so that by means of passages of Scripture members might be built up in their faith. He took care for the future of the church by sending to Bristol College, Edward Fall whom he baptised in 1803 and who succeeded him as pastor. In 1811 he retired to Bath where he died in 1818 "happy in Christ." His notebooks and papers, some of which are at the Rugby church, indicate a man of nervous excitable disposition, of deep piety sustained by a constant study of Scripture, and of a personal faith centred in Jesus Christ. In a phrase used of him in the Evangelical Magazine of 1797, he was "a signal monument of Divine grace." In 1881 the old chapel and schoolroom were pulled down and a new building put up in their place. The schoolrooms could accommodate 350 children and had access to a gallery at one end on the chapel. The Regent Place church and schools shortly after construction, ca. 1910-1919. In 1901 a new minister, the rev. John Henry Lees, was welcomed to the church and, when the centenary was celebrated in 1903 it was evident that more room was needed. A new site was purchased in what is now Regent Place and at 7 o'clock on a frosty morning in February 1906 the last sermon was preached, the last hymns sung and the last prayers offered in the old chapel. After a final look around, the minister, congregation and children filed out and marched to the new church building singing "Onward Christian Soldiers". The old building had served them well for 103 years. The present building has now served the church even longer, having celebrated its centenary in 2006! The Church History has been updated slightly from the text found in the 2003 Bicentennial booklet. The first part of the account above was recorded in a leaflet published in 1953 by Harry Gay, with text by Dr. L. G. Champion.